Crossword answers that turn up frequently in crossword puzzles are called repeaters. Many repeaters are very common everyday words, like ERA and IDEA. Don't be fooled by appearances though. Knowing a word and finding it from an obscure clue are two very different things. Check out Volume 1 of Word Buff's 'Totally Unfair' Word Game Guides! 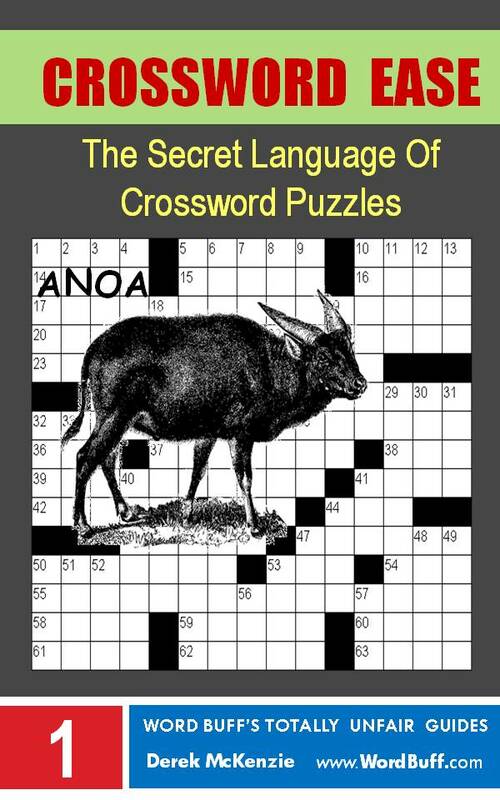 Other repeaters, like ANOA, are very obscure words that turn up frequently because their vowel-consonant patterns make them very crossword-friendly. These repeaters are called crosswordese, and I'm afraid you just have to learn them. Here is a list of the most frequent repeaters appearing in a selection of major American newspaper crosswords. I've included a range of clues for each crossword answer to give you a feel for the variety of clues you are likely to meet when attempting a crossword puzzle. I've organized the crossword answers in order of increasing word-length. The smaller words turn up much more frequently than the longer words, so you should learn these first. And remember, don't skip over the easy words! Check that you understand all their sneaky clues first. Would you have guessed the answer ARE to the clue [Cost]? NOTE — If you're interested in two-letter words, the reason there are none here is that most major American newspaper crosswords do not allow words shorter than three letters in length. Cure for being caught red-handed? Spread out on a table? Papas of "Zorba the Greek"
Beyond the very frequently occurring answers above, studying crossword answers by frequency becomes a bit haphazard and inefficient. A better way to proceed, once you've mastered the words on this page, is to organize answers into theme-based lists. Under each answer in each list, provide a range of clues (from easy-literal through to difficult-cryptic) that appear for those answers in typical newspaper crosswords.